“VALUE” A word uttered by many but understood by only a few! – What Qualities Should You Look for in Outdoor Furniture? Wood Lawn Chair – comfort at it’s best! a cheap table prone to cracking or warping from one that has been built to last. We want to share 4 solid and reliable signs of high-quality outdoor furniture. Use these tests on any porch swing, lawn chair, table, or outdoor bench you come see while shopping. 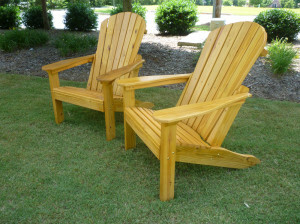 Nothing competes with solid, quality wood when it comes to outdoor furniture. Metal rusts, soft plastic warps, hard plastic chips and breaks, particle board snaps under moderate weight, and imitation wood cracks or even shatters. Solid wood that has been preserved with thorough weatherproofing treatments will survive years and years of harsh sun, wind, rain, cold, and heat. Look for furniture that has been crafted from a single type of wood like pine, cedar, or the NEW Poly Wood material. Now that you have limited your search to wooden (or Polylumber) furniture, you need to be positive that the furniture was actually crafted well. Check the pieces (or photographs of the pieces) for rough edges, chips, or uneven joints. Everything should be flush, level, and even. All of this not only contributes to the pleasant appearance of furniture but also its stability and life span. Most shoppers have few problems with this step. Look at the furniture. How does it look? Does it stand out to you? Does it look dated and bland or timeless and attractive? Is there a pleasing paint job or finish? Attractive furniture should inspire fantasy—images of an outdoor piece under the shade of a mature tree, beside a swimming pool, or in the center of a porch. Only purchase something you love at first glance! The most important aspect of any piece of furniture is its practicality. Outdoor furniture, in particular, has to survive for many years under harsh outdoor conditions and remain multi-functional all the while. An exceptional dining set, for example, serves a number of purposes for homeowners, including dining, entertaining, displaying, relaxation, and holding heavy objects. Chairs must be comfortable and relaxing while also keeping you upright. Investigate any outdoor furniture you are considering for the above signs of quality, beauty, and durability. If any pieces pass the test, by all means, bring them home with you! Exceptional outdoor tables, for example, are hard to come across. Quality is rare; but when you find it, it stays with you for many years to come, offering endless possibilities for relaxation and entertaining in the great outdoors.